There’s no denying this is a lot better than the 1998 version. It clearly is. But that doesn’t mean its any good. That would be like comparing Ben Affleck’s Batman to George Clooney’s performance alone, and on that basis saying he did a good job. 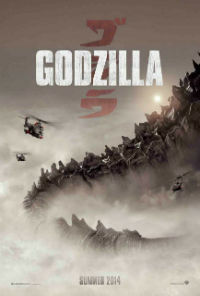 Gareth Evans’ version is much more true to the original Godzilla films. He’s done a fantastic job of blowing out the scale of the monster and the destruction caused, but keeps it quite intimate and proportional for the viewer – the best example of this is the paratrooper scene from the trailer below. It’s impressive on the big screen. However, terrible dialogue, major plot holes and really, really poor acting makes this one of the worst films to come out this year. What’s most annoying about people’s reactions to this film is they’re comparing it to Independence Day – saying it’s “The best disaster movie since ID4”. I’m not upset because I love ID4 (which I do) or even because I think ID4 is a well-made movie (which I don’t) – it’s because there’s nothing to compare. THEY’RE THE EXACT SAME FILMS. There’s the family-orientated soldier (Will Smith or Aaron Taylor-Johnson), who is a symbol for American patriotism, his wife (Vivica A. Fox or Elizabeth Olsen) and son, there’s the kooky old-timer who rants about crack-pot theories that are actually true (Randy Quaid or Bryan Cranston), the eccentric scientist who mumbles theories to himself and eventually solves the problem (Jeff Goldblum or Ken Watanabe) and this goes right down to the soldier friend who spouts cheesy one-liners (Harry Connick Jr or Victor Rasuk). Even the bug-like creatures look just like ID4’s aliens. So I guess you could argue I’m not upset with the comparison itself, just that we’re comparing them at all – after all, ID4 was released almost 20 years ago. Nothing has changed except for the special effects and it’s frustratingaudiences are still willing to fork out $20 a movie ticket regardless. Unfortunately, even an impressive cast can’t even save this sinking ship. They’re even partly responsible. I was really looking forward to seeing Aaron Taylor-Johnson and Elizabeth Olsen joining Joss Whedon’s next Avengers film, but not anymore. Taylor-Johnson bulked up way too much, losing his appeal as a confident geek and instead coming across as a timid version of Channing Tatum. His neck is actually thicker than his head. Elizabeth Olsen doesn’t do much apart from sob, sob while smiling, sob while talking on the phone and sob while running. Look out for the scene where she’s looking back and running (and sobbing obviously). It’s laughable. She’s clearly just running on the spot. Ken Wantanabe and his assistant, played by Sally Hawkins, are perhaps the worst. The build towards Wantanabe saying the name “Godzilla” is extremely over-the-top, and Hawkins spends the entire movie shaking and looking confused. Bryan Cranston’s involvement is a big shame. Not because he’s bad, but because he’s in such a bad film. He must have been paid a lot to star and he’s not even in it for very long. As I said before, the special effects are impressive but you have to sit through so many irrelevant sub-plots, globetrotting set-ups and character arcs. It’s not worth the wait for the big finale. Honestly, this would have been better as 2-hours of monster fights. Gareth Evans has tried so hard to make this dumb action film feel smart, yet he misses all the minor details. Seriously, why does it take them so long to locate a 150-metre high monster? Aren’t people calling in emergencies about their houses being trampled by huge bugs? And why do they keep looking through binoculars when these gigantic creatures are right in front of them?